Parallel Coordinates Plot - "Profile Plot"
The Parallel Coordinate Plot (PCP) is another important visualization component which is introduced by NCVA to the statisticians supporting a number of important interactive visual analytics tasks, for example, to analyze the relationships between indicators and to see a profile for a selected region. Each region (country below) is represented by a string passing through the parallel axes where each axis represents a single indicator "Population 0-14" etc. Differences between highlighted regions can be found by visually comparing the profiles representing them. This has been a highly appreciated method to the statistics community. 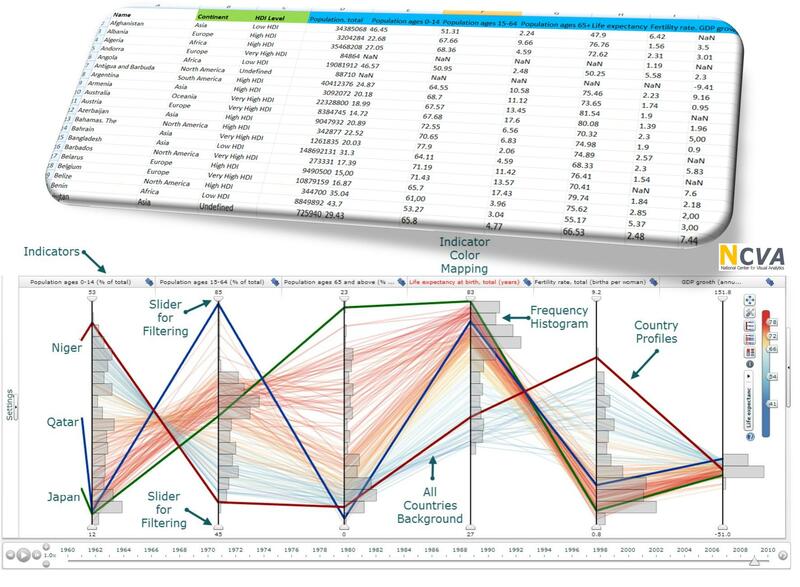 Statistical eXplorer introduces to the statistical community this well-known method from the Information Visualization area. 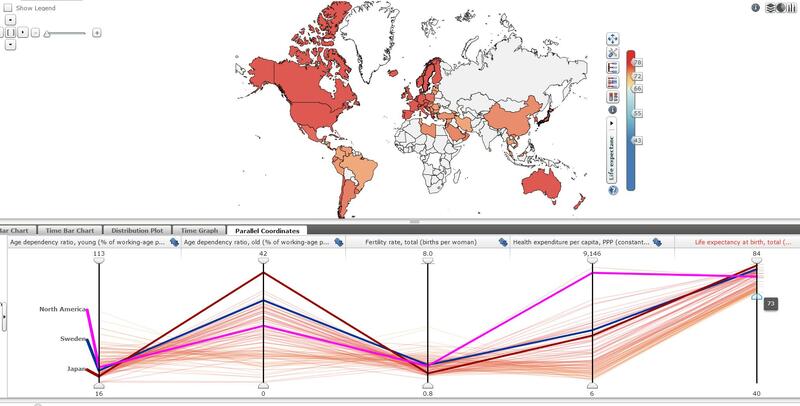 PCP is a proven visualization technique for identifying trends and cluster in many scientific environments and has now been used and evaluated in statistical visualization. PCP enables visual representation of spatial multivariate indicator data and hence could become an important mechanism in Statistics Analytics. Each country is represented by a string (line) passing through the “parallel axes” intersecting each axis at a point depending on the indicator value of region. Each axis represents a single indicator. The highlighted strings forms a visual representation of the characteristics of one region (Niger etc.). The NCVA PCP implementation has been extended with special features that are important to statistical exploration, such as histograms and filter operations based on percentile statistics. Histograms attached to each axis are used to visualize the distribution of indicator data, splitting the axes into a user defined number of equally high rectangular areas (bins). The width of a rectangle indicates the frequency of regions intersecting that bin. Statistical filter methods based both on ranges chosen by the user and on percentile calculations are embedded in the PCP attached to an indicator. Three countries Niger, Qatar and Japan are highlighted. Statistics eXplorer introduces to the statistical community a well-known visualization method from the Information Visualization area called Parallel Coordinates Plot (PCP). PCP is a proven visualization technique for identifying trends and cluster in many scientific environments but has not been used in statistical visualization. PCP enables visual representation of spatial multivariate indicator data and hence could become an important mechanism in Statistics Analytics. Each country is represented by a string (line) passing through the “parallel axes” intersecting each axis at a point depending on the indicator value of region. Each axis represents a single indicator. The four highlighted strings below form a visual representation of the characteristics of these countries Niger, North America (USA), Swedeb and Japan. Figure: Four countries Niger, North America, Sweden and Japan are highlighted with thick lines and coloured in the PCP above. Another advantage with the NCVA PCP exploration technique is its capability to dynamically make visual inquiries and filter data. Filtering data is a critical step in the process of data analysis. Filter out uninteresting regions; reduce the data set to a smaller, more manageable size. Each indicator axis has a pair of range sliders which define the bottom and top range for the query area. The range of an indicator can be specified by “dragging” the handles on the top and bottom of the corresponding range slider. Regions with values for a selected indicator, that fall outside of the spec­ified range, are filtered out. Figure: Dynamically make visual inquiries and filter data. A combination of range slider movements can be used to dynamically formulate a more complex visual inquiry. These visual conditions and constraints will immediately re­flect the visual contents in all linked views. An example of a query using the sliders is shown above. After a dynamic query operation, applied to the indicator "Life expectancy at birth”, countries with a value below 73 are removed. A tooltips shows the exact value for the slider position along the indicator axis. A second condition could be given etc..
Another famous multivariate visualization technique is the Radar Chart. Below is a comparison demonstrator for a better understanding of the difference between a Radar and PCP implementation. Figure: Demonstrator for educating students about how to use multivariate visualization with a radar and PCP. Here demonstrated with a linked World Map, Radar Chart and Parallel Coordinates "Profile Plot". Use the web link below to open the demonstrator in this mode.